It seems like the 23 Video launch made quite some noize… and now 23 Video competitor DigiEyeZ is also giving 23 Video platform a spin..
Do you want to test the 23 Video platform like DigiEyeZ? 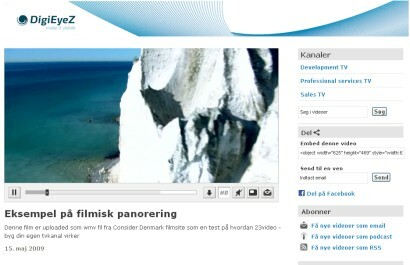 23 has now the full presentation from the 23 Video launch online – sorry, only in Danish. I’m in fact looking forward to see the 23 Video presentation in full – did miss quite a lot because I was busy pouring up Champaign.